An ugly tale of gold, greed and politics in mid-19th-century America. Richards (History/Univ. of Massachusetts) begins with a deadly 1859 duel between two prominent California Democrats: David S. Terry, chief judge of the state court, and U.S. Senator David Broderick. Like their state, their party and the rest of the country, they were divided over slavery. Nonetheless, wonders the author, how could angry words have led pro-slavery Terry to actually kill free-soiler Broderick? For the answer, he whisks us back to the 1848 discovery of gold at Sutter’s Mill and the ensuing “rush” to the region. He gives us glimpses of life in the camps, describes the various means of extracting ore from the ground and shows Big Mining muscling in to replace the rugged individual miners. 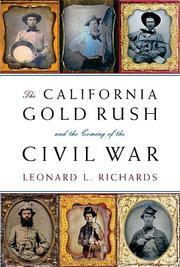 But Richards is far more interested in explaining how the Gold Rush affected local and national politics. He tells the intricate story of California’s admission as a free state in 1850, a galvanizing moment in the contest for power between slave and non-slave states. He reminds us of the Wilmot Proviso, the Gadsden Purchase, the Kansas-Nebraska Act. Modestly incompetent presidents Fillmore and Buchanan stroll the stage. We follow the doings of the famous (John C. Frémont, Stephen A. Douglas, Jefferson Davis, Cornelius Vanderbilt, Abraham Lincoln) and the not-so-famous (William Gwin and John B. Weller). Richards closes with the duel, which free-soilers used to discredit pro-slavery Democrats as assassins. An epilogue traces California’s role in the congressional wrangling that ultimately led to the Civil War and describes Terry’s ironic death in 1889—shot by the bodyguard of a man he slapped in an attempt to incite another duel. Brings to life a population of scheming officeholders, xenophobic Californians and frantic slaveholders, all of whom resorted to the ultimate frontier solution: violence.